Please join us for the 2019 Quinn Dinner! Click here to download a registration form. It's time to nominate a member for her outstanding service! Click the image below to download a nomination form. DKG changes that affect our chapter. CLICK HERE to view our new recruitment video. Now is the time to apply for New York State awards, grants, stipends, and scholarships. You/Your project may be eligible for support. Click here for more information. All Delta Kappa Gamma members are expected to have an Association pin. You may be unaware that DKG pins are supposed to be returned to one's chapter eventually, since only DKG members are allowed to wear them. A form is available that you can sign and put with your other jewelry so that others know how to dispose of your DKG jewelry if you are unable to do so. ​To recieve a copy of this form, contact Membership Committee Co-Chair, Linda Kotwas. Key pins are sold by the Society and can be purchased by CLICKING HERE. 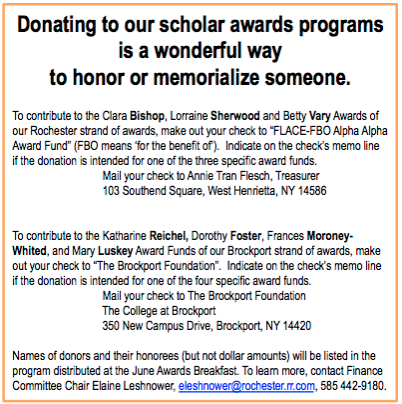 High school seniors interested in pursuing an education degree at The College at Brockport are invited to apply for financial assistance. Click HERE to download a flyer with more information. Alpha Alpha Chapter is located in the Rochester, New York area. professional and personal growth for women educators and excellence in education. The Vision Statement of The Delta Kappa Gamma Society International is "Leading women educators impacting education worldwide."